Institches with Bonnie: Top Done! I started this Plus quilt in December. I bought 5 matching charm packs from Connecting Threads when they were on sale for $1.00 each. BARGAIN! Except when I started planning the quilt I only used the fall colors leaving the brighter colors for another quilt. 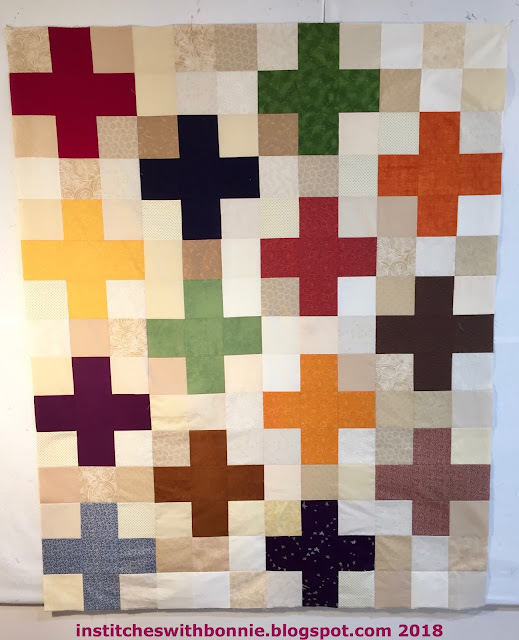 I cut out several of the blocks from either fat quarters or yardage. All of the background fabric came from stash. I am linking up with Needle and Thread Thursday, Can I Get a Whoop, Whoop?, Finished or Not Friday, Wips In Progress. Some of these I'll have to link with tomorrow. Spend some time checking out what folks are working on these days. I always spend a bit of time checking out others blogs. I really enjoy it but boy do I get way too many ideas. You made some great progress with your pluses. Those fall colors are so rich. It's nice to be able to pull from the stash some, even the new stuff was in the stash and it's not. Happy stitching this weekend. Oooh, I like this one! I really like the contrast between the pluses being one fabric each and the background being scrappy. It makes the pluses seem really solid and firm, floating against a changing background. Looking very nice and that was a really great bargain.